FOR MANY Argentines, January and February are idle months. But politicians who hope to unseat the country’s president, Mauricio Macri, in elections this year have been busy. Juan Manuel Urtubey, the governor of the north-western province of Salta, toured the beach resorts with his wife, an actress, and his baby daughter. “I know I can be president,” he told the sunbathers. Cristina Fernández de Kirchner, who was president before Mr Macri, made clear that she would like to regain the job. She posted a video with the legend “A better Argentina, together we can do it!” Sergio Massa, once Ms Fernández’s chief of staff, took a road trip in a small SUV to tell Argentines that “it’s time for real change”. The main potential challengers are Peronists, adherents of a populist movement that has governed Argentina for most of the past 70 years. Argentines, and anyone else with money at stake in the country, are wondering anxiously which sort of Peronist will lead the opposition to Mr Macri and how likely that person is to win the presidential election scheduled for October. Mr Macri is trying to undo Ms Fernández’s Peronist policies, which left Argentina with huge budget deficits, high inflation and weak growth. But he started too cautiously, undermining investors’ confidence in his programme. That, together with rises in American interest rates and a strengthening in the dollar, caused a currency crisis, which led to a recession, much higher inflation and a $57bn bailout from the IMF. Mr Macri must now slash the budget deficit. His approval rating is just 35%. Inflation, which was more than 47% last year, is the top concern of nine out of ten voters. Investors are terrified that Mr Macri’s mistakes will bring a Peronist back to power. They are especially scared of Ms Fernández. “If Cristina wins, the first reaction of markets will be horrible,” says Miguel Kiguel, an economist in Buenos Aires. 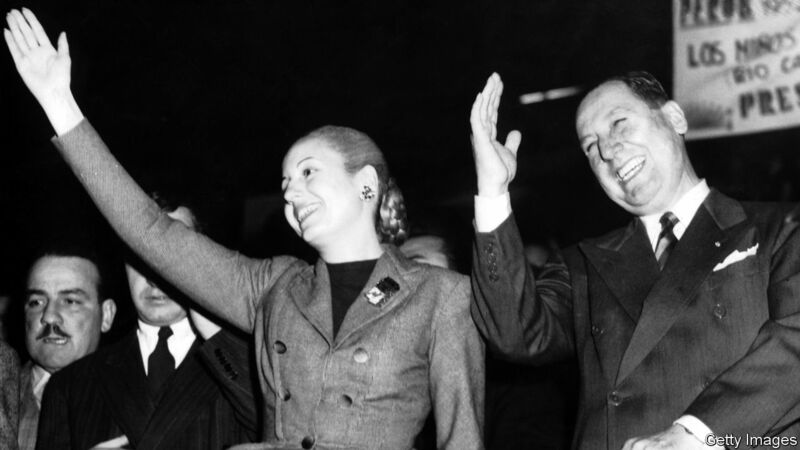 The politics of Peronism are complicated. Ms Fernández is the movement’s most popular leader by far, with the support of 30% of the electorate. But she is also the least popular, with a rejection rate of more than 60%. In part that is because she and her government are seen as exemplars of corruption. She has been indicted six times. The media have carried reports that she was the intended recipient of bags stuffed with cash so large that their contents were weighed rather than counted. On December 27th police seized 33 valuable works of art at a flat owned by Ms Fernández in Buenos Aires. One of her former vice-presidents and a public-works minister in her government are in jail and the head of the tax service has been indicted. Despite that, Ms Fernández is certain to be the nominee of her Citizens’ Unity party. The other Peronists are likely to fight each other to be the candidate of Federal Alternative, the movement’s “moderate” wing, in a primary to be held in August. That person will face Mr Macri and Ms Fernández in the first round of the presidential election. If no one wins more than 45% of the vote (or 40% with a lead of ten percentage points over his or her nearest rival), the top two finishers will face off in a second round. Besides Mr Urtubey and Mr Massa, possible contenders for the moderate mantle include Roberto Lavagna, a former economy minister, and Miguel Pichetto, the Peronist leader in the senate, whose anti-immigrant, tough-on-crime views echo those of Brazil’s right-wing president, Jair Bolsonaro (a comparison he rejects). Peronists of all hues seek to weaken Mr Macri by railing aginst his economic programme, including the IMF deal. The most extreme kirchneristas threaten to tear it up and default on the country’s debt, as the government did in 2001. Moderates talk of renegotiating the IMF deal (Mr Urtubey dodges the question). They promise to freeze prices of energy and transport and raise pensions, which would increase the budget deficit. In private, the moderates are more sensible. They accept that the economy needs such Macri-esque policies as cuts in public spending and reform of Argentina’s rigid labour laws, which discourage hiring. But their pre-election rhetoric will be aimed at pleasing voters rather than the financial markets. Mr Macri hopes that the moderate Peronists will be forced out of the race in the first round, leaving him to face the divisive Ms Fernández in the second. A negative vote—in this scenario against Ms Fernández—“almost always proves more strong than the positive vote”, says Jaime Durán Barba, Mr Macri’s political adviser. Boyish Mr Urtubey and sharp-tongued Mr Massa look like bigger threats. The president is also counting on a “light recovery” of the economy by October. Two-thirds of Mr Macri’s base think the economy will improve this year and are willing to vote for him again, says Eduardo D’Alessio, of D’Alessio IROL/Berenszstein, a pollster. Until recovery happens, Mr Macri will talk about almost anything but the economy. His state-of-the-union speech, scheduled for March 1st, is likely to dwell on his favourite topics: the governmement’s crackdown on crime and drugs and its construction of roads, sewers and schools, which has been slowed but not ended by austerity. Mr Macri pays weekly visits to the homes of ordinary people, ringing the doorbell himself. If the Peronists will not rest, neither can he.